Dalsa is a semiconductor imaging company based in Canada. The company specializes in producing image sensors for the industrial and scientific market. Dalsa provided many of the sensors on NASA’s Mars rovers. The company was acquired by Teledyne in 2010. 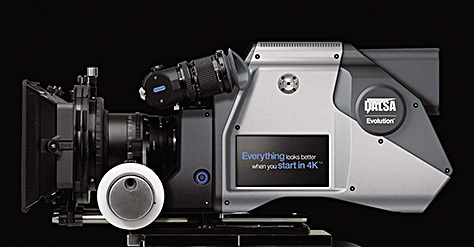 The original Dalsa Origin was the first large single-sensor 4k digital cinema camera when it was introduced as a prototype at NAB in 2003. Dalsa invested heavily in this project. They established a facility in Woodland Hills, CA where their cameras and lenses were intended to be offered as rental only items, following the Panavision model. The original Dalsa Origin camera was quite large and heavy. A smaller and lighter Dalsa Origin II “Evolution” camera was introduced in 2007. 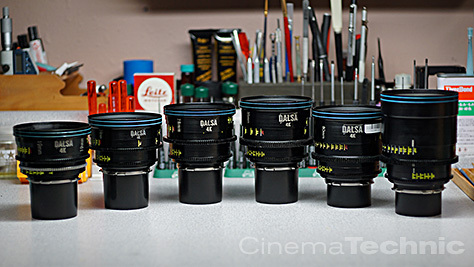 The Dalsa Digital Cinema prime lenses are a unique set of cine lenses that were developed for for the Dalsa Origin II 4k digital cinema camera around 2007. The lenses were designed to complement the Origin cameras and were intended to be offered on a rental-only model, and only went out on 4k rentals. They were built around Leitz Leica-R stills lenses. The original Leica-R lens mechanics were removed, and the optical “cores” were installed in new custom designed housings. Since these lenses were designed for the 35mm still film format (FF35 24 x 36mm), they were able to cover the Dalsa 4k sensor which was slightly larger than Super 35 (18 x 24 mm). The housings use either a cam/follower focus system or a combination of cams and focus threads. The optical blocks are mounted on linear bearings for smooth movement along the optical axis. The Dalsa 4k lenses were not intended to ever be sold, and they were meant to be frequently serviced – every time they came back from a rental. The Dalsa 4k lenses were specifically designed to thwart anyone who attempted to disassemble a lens. The company was concerned about the potential that the lenses might be rented, disassembled and reverse-engineered. So they are, in effect, “booby trapped”. If a Dalsa 4k lens is disassembled using the wrong procedure, it is nearly impossible to re-assemble it correctly. NOTE: CinemaTechnic, in consultation with the original manufacturer of the lens housings, has developed service procedures for the Dalsa Digital Cinema lenses. We have successfully repaired multiple Dalsa lenses, including two that were dropped. If you have a need for service on these lenses, please get in touch via email. In the end, only 14 Dalsa Origin cameras were built, and only 11 sets of Dalsa Digital Cinema lenses were built. NOTE: Following a convention that is common with low-volume rehoused lenses, the iris scales are marked in T stops, although the values more likely represent f stops. As a rough guide, for modern multi-coated prime lenses, the T stop is usually at least 0.1 stop slower than the f stop. So the f1.4 lenses are likely T1.5, the f2.0 lenses T2.1 and the f2.8 lenses T2.9 or 3.0. Dalsa was a publicly traded company, and due to the combination of the economic crisis and beginning of the Great Recession, and subsequent shareholder pressure, Dalsa closed its digital cinema division in 2008. Most of the remaining Origin cameras were sent to Ryerson University in Toronto, Canada. Two Origin cameras are held by the Academy of Motion Picture Arts and Sciences Pickford Center. After the close of the Dalsa Digital Cinema division, most of the Dalsa 4k Primes were offered for sale by Alan Gordon Enterprises. Most have found their way into the hands of owner-operators.